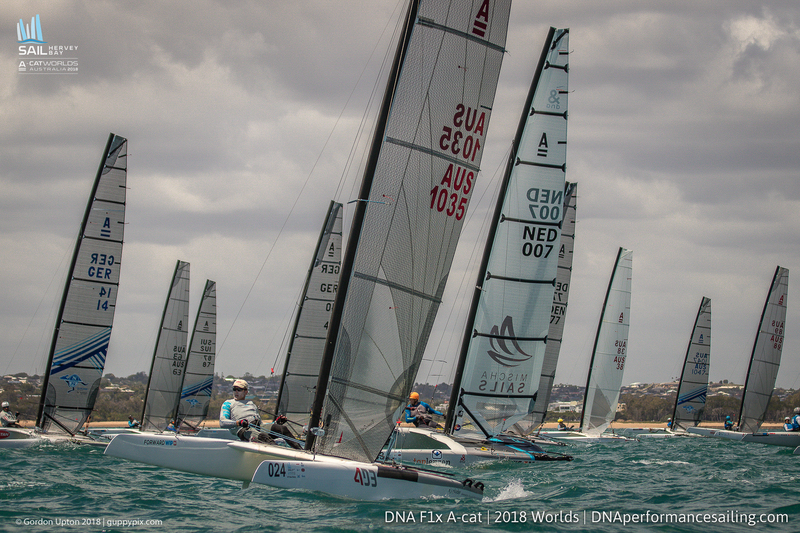 Racing started today in earnest at the ‘A’ Class Worlds on the beautiful warm waters and beaches of Hervey Bay in Australia. Following the cancellation of yesterday’s racing after all the fleet had arrived at the race areas. The weather was a little kinder. The winds had dropped to a lovely 12-18kts. However, it was swinging 10 to 15 deg all day a coming feature of the South Easterly wind direction as it comes over a promontory, and this also results in more gusty conditions. The effect was to make it seem like sailing on a huge lake, and indeed the lake sailors felt at home. Getting into the correct sequence with the wind swing was a skill few mastered today, with even the best getting caught out sailing into headers and holes occasionally. Two courses are run, one each for the two ‘A’ Cat divisions. 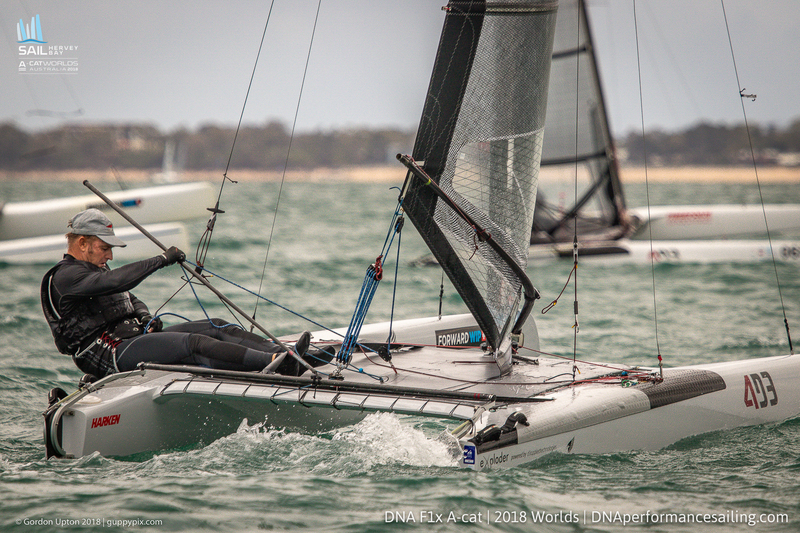 This is the first Worlds where the two different versions of this 52 year old development class single handed thoroughbred catamaran have been separated in a championships. The Classic, usually the C and straight board, boats that do not foil but sail in a displacement mode. And the Open or Foiling division where all the boats are allowed to fly on their foils. Both types will measure as ‘A’ Cats, but due to their speed differentials and differing sailing angles in higher wind conditions, it was elected to allow a separation of the types into two divisions. Most events run the two together and split out the results, but for the big ones, it is separated for safety reasons. In Hervey bay this year we have a split of about 70/30. The split meant that many more Classic sailors turned up, as they now no longer feel they had been left behind due to their lack of circus skills or desire to remain in one piece. This year, the standard of competition has gone to a whole new level: we have at good hand full of America’s Cup sailors in the fleet and at least a dozen Olympians, plus a woman voted 2018 World Sailor of the year. On both fleets the race officers got all their 3 races away cleanly. The tide flow away from the line certainly helped in that regard. On the Open Course, the superstars lost no time in starting combat. 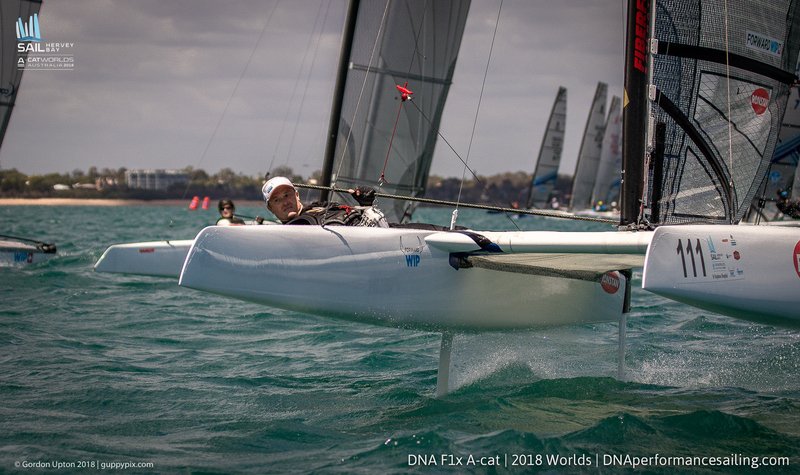 The nine time ‘A’ cat World Champion, and ETNZ winning skipper Glenn Ashby set of like a scalded cat from the pin end and in the first two races pulled ahead to a good lead by the first mark. He then simply increased that distance on the rest of the fleet. 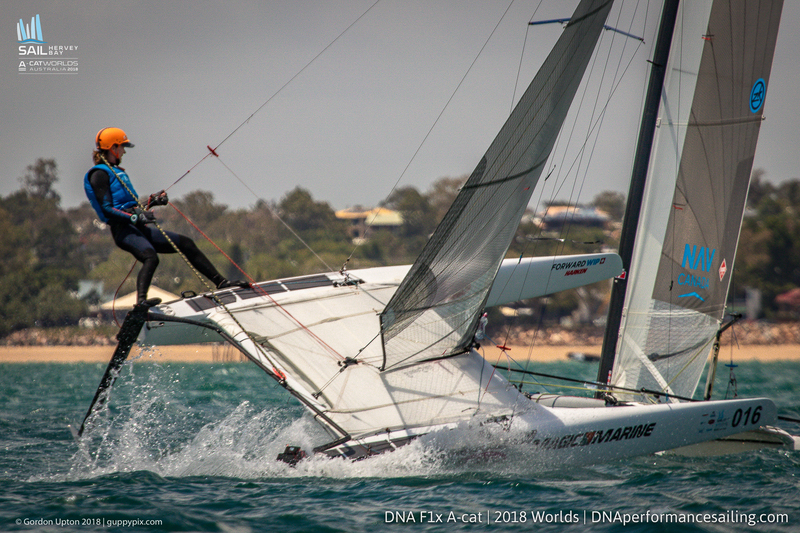 His ETNZ team mate, Peter Burling tried his best to hold onto him, as did the Dutch double World champion Mischa Heemskerk and Burling’s Olympic Gold winning 49er team mate, Blair Tuke. Glenn’s Olympic silver Tornado helm, Darren Bundock tried in vain to keep up also. But Glenn was having none of it. In the third race, he found himself in a hole, something we can all do with monotonous regularity, so we can take comfort from the fact it happens to the World’s best Cat sailor as well. This dropped him down to 5th at the first top mark. AUS sailor Steven Brayshaw held the lead for a whole lap - something he can tell his grand kids about, and with Misha following before the little Aussie caught them both, passing them as if they were stationary too. He did a 13 min lap on race one, taking 8 mins to reach the top mark 1 nm away. The other thing the ETNZ guys are doing is dialing differential rudder rake. This is like increasing the downforce on a racing car. The windward rudder is raked to a lesser angle than the leeward one giving the windward hull more grip in the water at the T foils on their tips pull rather than push, and allowing more power to be put into the rig. On the tack and gybe, they pull a control that reverses it all to the other side. This is pretty sophisticated stuff and requires a good deal of setup knowledge as regards the optimum angles. We saw it in the last America’s cup, and this is a good example of technology trickle-down from such events. Further down the fleet, other battles ensued as sailors found themselves amongst their peers on each new tack crossing. Gains and losses where maid, as were mistakes, several on the last gybe before the finish as they tried to thread the needle of a start line after coming in from a fast shallow angle on their foils. There was no particularly favoured side to the course as the wind was swinging back and forth. Trying to remain in sync was the challenge here. At the end of the three races Glenn lead with 3 bullets. Mischa and Blair traded positions with each other and Mischa came out on top. The reigning World Champion, Stevie Brewin, who was struggling for pace at the previous weeks Nationals, got a 2ndin race 2 but ended the day in 6th behind Bundy, who in race 2 had his rudder tangle in the top mark anchor line as he rounded the newly positioned mark. This damaged his rake mechanism. He protested the committee and was awarded average points for that race as redress. Several sailors went for a swim, a few just before the finish at the last gybe under pressure. But none were eaten. Over on the Classic course, former European champ and AUS Olympian Andrew Landenberger dominated from former World Champion AUS Scott Anderson. Landy has ‘switched codes’, to steal a term from rugby, and moved onto the Classics. He feels the racing can be closer and more enjoyable as it offers him fewer near death experiences. This is something we are finding in the A Cat fleet more, especially with the older sailors who’s boats now have a new lease of life in the Classic division. Landy finished with 3 clean bullets but Scott was continually chased around the course by the ‘Big Swede’ Alberto Farnassi on his old Marstrom. Wind is this guy’s friend so beware when it is blowing, as he’s usually right up there. 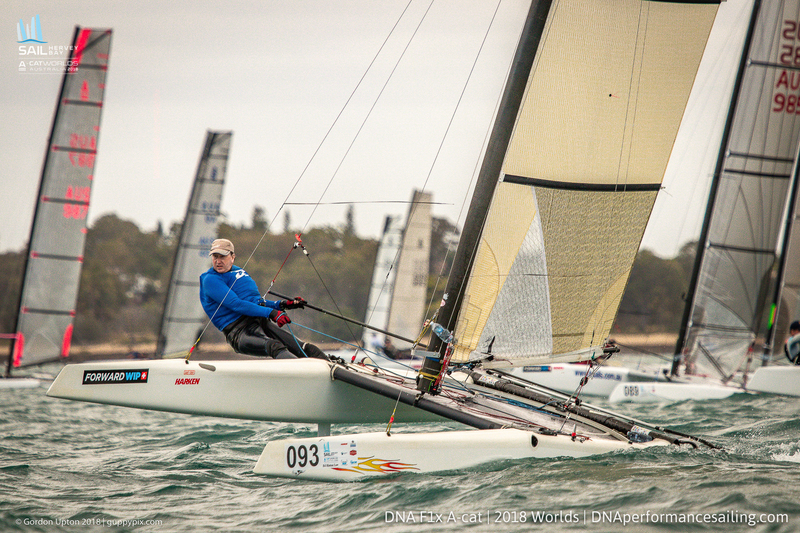 AUS sailors Matt Johnson and Paul Neeskins finished the day in 4thand 5th. It was a good hard days racing for both fleets. The gusts and shifts made for some good tactical and enjoyable racing . It is great to see the ‘Normal’ sailors having a good time alongside the superstars on the same course. The next day promises a little less wind, with 3 more races are programmed of each fleet. This is fun!